The Stainless Steel 1/1 13.5 Litre Electric Chafer Dish X85187 is an attractive looking, very versatile unit for heating and cooking your food with. This chafer dish has a large 1/1 Gastronorm stainless steel pan for keeping your food and sauces inside, making it a great choice when serving hot food at a large lunch or buffet. This chafer dish has a central power dial for adjusting the cooking temperature, and a side LED light for added safety when its on. The Stainless Steel 1/1 13.5 Litre Electric Chafer Dish X85187 uses wet heat to heat up your food, and the stainless steel frame gives it great portability for placing on your tabletop. 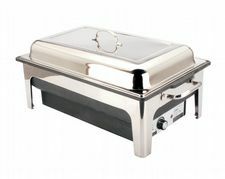 The Stainless Steel 1/1 13.5 Litre Electric Chafer Dish X85187 has a thick steel top lid that helps to keep in the heat and keep your food warm, and four steel legs for added stability.